If it has to be a chain, the above would be preferable to 'Pizza Hut'!!! The nearest, I believe, is in Truro, situated in the Coinage Hall building, and the pizzas are delicious. I heard from two other people today that its Pizza Express. I have heard it to be Pizza express also Mc.Donalds is possibly going into Whites. Great - not! We need a place to buy normal clothing including pyjamas and undies! St Ives should have a massive, specialist art-supplies shop too. We do not need more food outlets - or pubs. 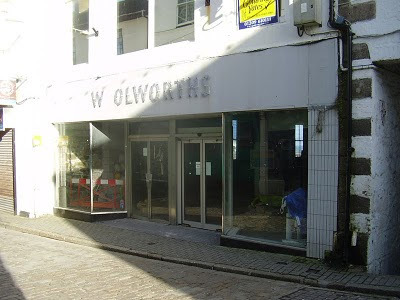 A decent youth centre would be good - internet cafe/online gaming club/dance venue for Nos Lowen etc - bleah - but that wasn't your question, was it! sorry - had to vent! Looks like it is Pizza Express for Woolworths. The St Ives Town Council website lists an extraordinary meeting of the Planning Committee tomorrow (18th Feb). Agenda is: 35-37 Fore Street, St Ives (Gondola Group). Change of use of lower basement & basement from retail a1) to restaurant(a3). Gondola Group are the owners of Pizza Express. This is a shame. Although Pizza Express is probably the best of the bunch it is worrying because it will force up rent values and some of the smaller and maybe less profitable shops will be forced out leaving way for more chain stores who can afford the rents and rates. Does St.Ives council consider what will happen to Peppers and the other Pizza Pasta restaurant? As for McDonalds. Please no! It is Pizza Express and it opened last night!